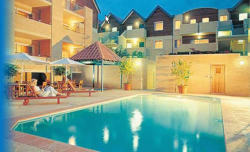 Welcome to our selection of holiday homes to rent in Australia. Australia is an island country in the Southern hemisphere, which bears the official title "The Commonwealth Of Australia". It is sandwiched between the Indian Ocean to the west and the Pacific Ocean to the east. The Australian continent also consists of the surrounding islands, such as Tasmania. It is commonly known for being directly opposite Britain on the globe, hence the informal name "Down Under". A great proportion of the land is either desert or semi-arid, since Australia is the driest inhabitable continent on Earth. However because of its sheer size there is room for different types of landscape such as forest or urban areas. Its situation as a separate continent means it contains animals the likes of which are found nowhere else in the world. The most obvious are the group known as marsupials, including kangaroos, wallabies and koalas. The most obvious activities to pursue around Australia would be natural exploration. The seas surrounding Australia are tropical, clean, and packed with wildlife guaranteed to fascinate the British explorer. Sea lions, dolphins and whales inhabit the warm coastal waters and tour services provide boating or diving trips all around the coast. The 1,500 mile long Great Barrier Reef is probably the most famous natural marine formation in the world. Further inland, the outback is so huge that chartering a plane may be the only practical way to see it. Interesting things to see may include Aboriginal cave paintings or dinosaur footprints. Looking for self catering holiday accommodation in Australia? then below is a selection of villas in Australia and apartments in Australia that can be rented direct from their owners. You can either click on each listing for further details or you can use our search engine on the left if you are looking for something in particular. Here you can find useful links for tourist attractions and services in Scotland including links to the Sydney Opera House, Hunter Valley Wineries, Jenolan Caves, Great Barrier Reef, Kakadu National Park, Fraser Island and Kangaroo Island.